"The McCain family deserves better," GOP Sen. Johnny Isakson said. Georgia GOP Sen. Johnny Isakson on Wednesday denounced President Trump's continued attacks against Isakson's Republican colleague, the late Sen. John McCain. “It's deplorable what he said,” Isakson said in an interview with Georgia Public Broadcasting’s “Political Rewind” radio show. “It will be deplorable seven months from now if he says it again, and I will continue to speak out,” Isakson added. Isakson, who chairs the Senate Veterans Affairs Committee, said Wednesdaythat he’s most concerned about Trump’s remarks as it relates to US military service members and veterans. Isakson characterized Trump's attacks against McCain as a "lack of respect for his service." "I just don't think it's appropriate," Isakson said. “You may not like immigration, you may not like this, you may not like that, you may be a Republican, you may be a Democrat - we are all Americans. We should never reduce the service they give to this country,” Isakson said. Earlier Wednesday, Isakson had promised to deliver a 'whippin' on Trump for his attacks. "I want to do what I said that day on the floor of the Senate," he said. "I just want to lay it on the line, that the country deserves better, the McCain family deserves better, I don’t care if he’s president of United States, owns all the real estate in New York, or is building the greatest immigration system in the world. Nothing is more important than the integrity of the country and those who fought and risked their lives for all of us," the Republican chairman of the Senate Veterans' Affairs Committee said in an exclusive interview published Wednesday with conservative outlet, The Bulwark. 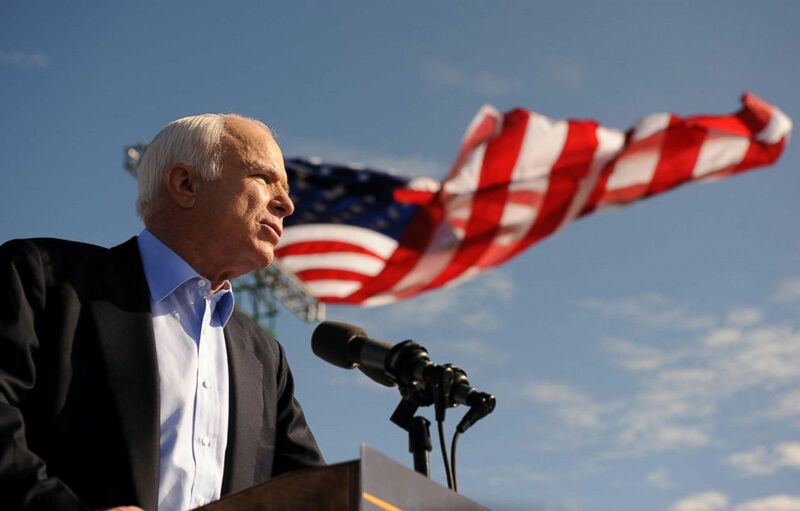 (Robyn Beck/AFP/Getty Images, FILE) Sen. John McCain speaks at a campaign rally at Raymond James Stadium in Tampa, Florida, Nov. 3, 2008. McCain passed away seven months ago after battling brain cancer. Isakson spoke on the Senate floor following McCain’s death and issued a stern warning to those who would speak ill of McCain. "I don’t know what is going to be said in the next few days about John McCain by whomever is going to say it or what is going to be done, but anybody who in any way tarnishes the reputation of John McCain deserves a whipping because most of those who would do the wrong thing about John McCain didn’t have the guts to do the right thing when it was their turn," Isakson said last August. "We need to remember that. So I would say to the president or anybody in the world, it is time to pause and say that this was a great man who gave everything for us. We owe him nothing less than the respect that he earned, and that is what I intend to give John in return for what he gave me," Isakson said. 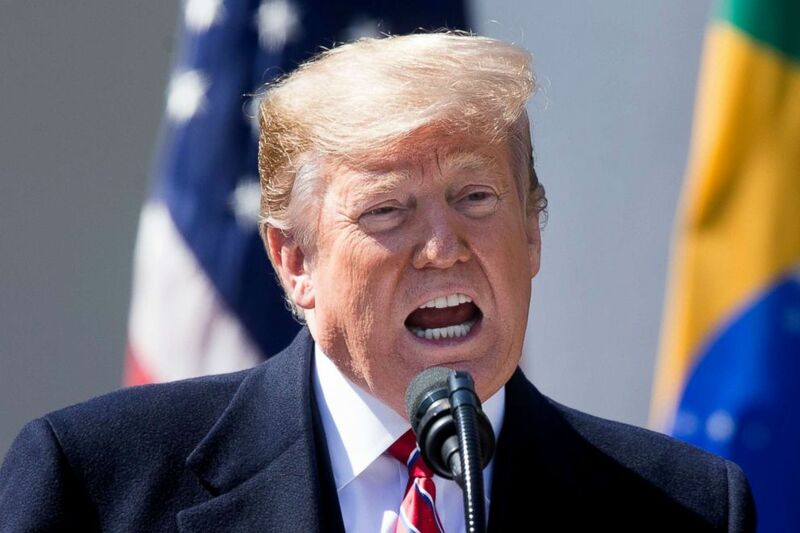 (Michael Reynolds/EPA via Shutterstock) President Donald J. Trump speaks during a joint news conference with Brazilian President Jair Bolsonaro in the Rose Garden of the White House in Washington, DC, March 19, 2019. But the president paid no heed to those warnings. On Tuesday, the president criticized McCain, pointing specifically to his vote against a repeal of the Affordable Care Act. "I'm very unhappy that he didn't repeal and replace Obamacare, as you know. He campaigned on repealing and replacing Obamacare for years and then they got to a vote and he said thumbs down," Trump said. Adding, "Plus there were other things, I was never a fan of John McCain and I never will be." The president's comments came during an Oval Office meeting with the president of Brazil and after a series of weekend tweets in which Trump blasted the senator for his role in delivering a dossier containing unverified information that claimed Russia had compromising information on Trump to then-FBI director James Comey. There is no evidence that McCain shared the Steele dossier before the election. In 2018, ABC News reported that McCain hand-delivered a copy of the dossier to then-FBI Director James Comey in December of 2016, after the presidential election. McCain confirmed this and explained why he decided to share the document in his book "The Restless Wave." Isakson told the Bulwark: "America deserves better, the people deserve better, and nobody — regardless of their position — is above common decency and respect for people that risk their life for your life. When the president is saying that that he doesn’t respect John McCain and he’s never going to respect John McCain and all these kids are out there listening to the president of the United States talk that way about the most decorated senator in history who is dead it just sets the worst tone possible." Most Republicans who served in the Senate with McCain have largely remained silent on Trump's attacks. Senate Majority Leader Mitch McConnell did come to McCain's defense in a tweet, but did not specifically call out Trump by name. McCain's best friend in the Senate - GOP Sen. Lindsey Graham - spoke out Wednesday to condemn the president. "I think the president's comments about Senator McCain hurt him more than they hurt the legacy of Senator McCain," Graham said at an event Wednesday in Seneca, South Carolina. But, Graham added: "I'm going to try to continue to help the president." Graham has grown noticeably chummier to Trump in recent months and is now considered his close confidant on Capitol Hill -- beginning with golf outings to now taking frequent calls from the president. "I've gotten to know the president, we have a good working relationship, I like him, I don't like it when he says things about my friend John McCain," he said. "I love John McCain, I traveled the world with him, I learned a lot from him, he's an American hero and nothing will ever diminish that," Graham said. Graham received heat earlier in the week for tweeting about McCain without calling out Trump by name. Meanwhile, Senate Minority Leader Chuck Schumer tweeted that he would introduce legislation to rename the Russell Senate Office building in honor of McCain.